In Fall of 2017, Oklahoma State Regents for Higher Education reported a total enrollment of 199,646 post-secondary students across the state, a 2 percent decrease from the previous year. To combat this decline, and to fuel the growth of online courses and degree programs, the state’s regents created the Council for Online Learning Excellence (COLE). COLE works with Oklahoma colleges and universities to improve collaboration, provide resources, facilitate excellence in teaching and offer thought leadership in the world of hybrid and online higher education. The University of Oklahoma, Oklahoma State University and more than a dozen others are working with COLE to give students quality and affordable online degree options. Read on to learn more. As technology advances, more and more students are choosing to enroll in online courses. Online colleges in Oklahoma allow students to create their own schedules and study from anywhere with an internet connection. Distance learning programs especially benefit students in rural areas, working professionals and busy parents. In 2012, more than 26,000 Oklahoma college students (10.6 percent) were enrolled in a fully online program, with 45,000 taking at least a single online course. But which online colleges in Oklahoma give these students the best chance for academic and career success? See how Oklahoma’s top online universities stack up below. The University of Oklahoma's extended campus started in 1961, and it has since grown into one of the most successful extended campuses in region. The key has been OU's commitment to applying the same rigorous standards through their extended campus as they do with on-campus programs. Part of the modern extended campus is the online school, offering four unique bachelor's degree programs that can be completed in an online or hybrid format. With 22 different online degrees offered, Oklahoma State University has one of the largest selections of online programs in Oklahoma. For undergraduate students, there are 10 degree programs offered, all of which can be completed entirely online (unless in-person clinical experience is required). To specialize their education, students can also pick from a number of online certifications, such as marketing analytics and entrepreneurship. Transfer students can also get credit accepted, reducing the time it takes to earn a degree. Located just outside of Oklahoma City, Southern Nazarene University is a smaller school with an extensive alumni and professional network. SNU strives to innovate, something which is clear with their online school. Regular online courses only last an abbreviated 5 to 6 weeks, allowing students to jump in and out of studies to fit their schedules. Students focused on earning a bachelor's degree full-time should be able to complete their education in at least 4 years, and potentially less. One of the top private schools in the region, Oklahoma Christian University combines Christian ethics with their global perspective, offering over 20 study abroad locations. OC also offers courses for students who want to earn their degree online. Currently, the top online program at OC is their BSN completion program. The program has courses that last 8 weeks, and eligible students can earn their degree in as little as 16 months. The online school at Northeastern State University is comprehensive to say the least. There are over 400 courses offered in an online or blended online/in-person format, allowing students to study what they want, when they want. There are also 4 bachelor's degrees that are offered online: nursing, general studies, organizational leadership and hospitality and tourism management. Students can study these in a hybrid format if they want, but they are all entirely online ? with the exception of nursing since certification will require in-person clinical experience. Southwestern Oklahoma State University is often recognized for their graduate programs, but their 4-year undergraduate programs command the same respect. There are 2 fully-online undergraduate degrees offered by SWOSU: an RN-BSN program and a bachelor's degree in health information management. Graduates of the health information management program often go on to become health specialists, analysts or consultants. Students who study online will work through Canvas, a popular method for educating from a distance. With 17 different bachelor's degree options offered entirely online, Oral Roberts University has one of the most extensive online programs in Oklahoma. Along with their 4-year undergrad programs, Oral Roberts also offers certificates and minors to help students specialize their education. Everyone in the United States pays the same amount per credit hour, regardless of which state they live in, but international students will pay an adjusted rate based on the GDP per capita of their nation. Known for its combination of quality and affordability, Northwestern Oklahoma State University is a public university that receives incredible financial support from the community. There are 4 online undergraduate options, the most unique being the bachelor's of applied arts and sciences with a focus on technical management. While in-state students pay less in tuition than out-of-state students, some out-of-state online learners can get the additional tuition waived. Often recognized as one of the top private research institutions in the area, the University of Tulsa provides higher education at all levels, including some accelerate programs. While the University of Tulsa doesn't offer any entirely online degree courses, some students take online courses to go along with on-campus classes. The majority of the online courses offered by the University of Tulsa are meant to prepare students to join the workforce after graduation. Oklahoma Baptist University is a local leader in theological education at the highest level. Along with a variety of online master's degree programs, Oklahoma Baptist offers a variety of undergraduate degrees that can be completed online or in a hybrid format. For example, the school of Christian studies offers all of their courses in 8-week online formats, allowing students to study at their own pace and avoid commuting to campus. How can I find which online colleges offer the degree I’m looking for in Oklahoma? Selecting the right online degree is as important as choosing the right school. Students can view a list of available programs on each college’s website. Eastern Oklahoma State College, for example, has a web page that includes what to expect from online programs at the school, how to get started, student services, online learning resources and a complete list of online degree programs. Which online schools in Oklahoma will accept my transfer credits or work/life experience? 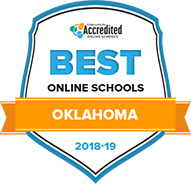 Most online colleges in Oklahoma accept transfer credits from regionally accredited institutions. However, the exact procedures and number of credits can vary. Make sure you investigate each school’s credit transfer policy and admissions requirements before making a selection. Some schools also grant credits for work and life experience. For example, the University of Oklahoma awards credits for military training. How Much More Do College Grads in Oklahoma Make? As in all other states, college graduates in Oklahoma earn thousands of dollars more per year than their counterparts with only a high school education. A bachelor’s degree can increase salaries by more than $26,000 per year. Let’s review the salary levels for occupations in Oklahoma by minimum degree level required. As energy technology continues to shape the world, consumable resources such as oil and gas will continue to compete with renewable energies like wind and solar. More than 10 percent of Oklahoma’s largest employers work in the oil and gas industries. To support more students in these industries, Oklahoma colleges are adding online programs in petroleum and natural gas engineering. As higher education continues to grow and expand across the country, it has never been more important to know which bodies and organizations accredit schools. Accreditation indicates that a school meets a minimum set of requirements and offers quality education to its students. Accreditation helps protect students from predatory organizations claiming to provide an education they cannot deliver. When vetting schools and their online programs, regional accreditation is the most important. The Higher Learning Commission grants regional accreditation to qualifying institutions in Oklahoma. The organization assesses colleges based on mission statement, student support services and enrollment profile. The commission also confirms that faculty, staff and administrators meet the claims outlined in the mission statement. Most employers and other schools prefer degrees with regional accreditation. Some schools also receive specialized accreditation for certain programs or departments. For example, the University of Oklahoma holds accreditation from the Commission on Collegiate Nursing Education. The Accreditation Board for Engineering and Technology has approved the engineering bachelor’s degree at Oral Roberts University. Although college graduates earn much more than their peers without degrees, a college education is still important to land some of Oklahoma’s most lucrative jobs. Students should research which schools they can afford and which financial aid options they can access. Public in-state colleges generally come with a lower price tag, while private universities can be a little more costly. Students can apply for aid through their state government, federal government, university and private sources. Let’s take a closer look at tuition rates in Oklahoma. What are Oklahoma’s requirements to qualify for in-state university tuition? In order to qualify for in-state tuition, students must first establish residency. Oklahoma defines residency as living in the state for 12 consecutive months and having a domicile in the state. This domicile must be the candidate’s primary residence, and students must prove that they intend to stay in Oklahoma long-term. Dorms and student housing do not qualify. Oklahoma students may also qualify for in-state tuition in two other circumstances. First, many online programs cost the same as campus-based programs for in-state students, regardless of where the online student lives. Second, more than 1900 academic programs across 15 states fall under the Southern Regional Education Board’s Academic Common Market. In this agreement, which includes Oklahoma, students who live in any of the 15 states can study in another for the in-state rate. Are online credits more affordable in Oklahoma than other places? Before making any decisions, be sure to fully understand each college’s online tuition and fee structure for a more complete look at the full cost of earning an online degree. How can I get help paying for online college in Oklahoma? Students can access several different financial aid opportunities to pay for college in Oklahoma. Candidates may receive assistance based on financial need, academic merit or a combination of both. Before anything else, students should make sure to fill out a Free Application for Federal Student Aid (FAFSA). By doing so, students apply for several different awards at once. Scholarships are the best form of financial assistance. Several different organizations in Oklahoma provide scholarships, including universities, non-profits, businesses, foundations and government agencies. Criteria vary, so make sure to read the requirements of each scholarship carefully. Some scholarships may seem small—only a few hundred dollars or less—but a host of small scholarships can add up. Oklahoma residents can also receive scholarships based on their hobbies, interests and extracurriculars. For example, the Oklahoma Quarter Horse Youth Scholarship provides funding to students interested in horses. Oklahoma’s Promise is a fantastic scholarship program that will cover at least a portion of tuition at an Oklahoma university or college. Parents of applicants must earn less than $55,000 per year. Students should hold a minimum cumulative 2.50 GPA, apply for other financial aid, not skip school and avoid drugs and alcohol. Candidates should participate in other Oklahoma’s Promise activities to prepare for college. Grants can also provide free aid to students. Organizations and governments usually award grants based on financial need. For example, the Oklahoma Tuition Aid Grant (OTAG) assists students based on their FAFSA information. OTAG provides 75% of enrollment costs or $1,000, whichever is lower. Undocumented immigrants that meet certain requirements may also qualify. Students may also pay for college using student loans. When students fill out the FAFSA and enroll at a college, the federal government offers to provide a certain amount of federal loans. Some of these loans do not charge interest while students attend school. Students should avoid private loans since financial institutions usually charge much higher rates and do not offer loan forgiveness. ReadySetRepay.org offers a plethora of information to Oklahoma students. Additional services. Oklahoma maintains several programs that can help students save for school and repay their student loans. Students should check resources available through the Oklahoma College Assistance Program. UCanGo2 also hosts information on applying for, receiving, repaying, and defaulting on student loans. Academic Prep for College: From foundational education courses in math, reading, writing and computers to English language classes for foreign language speakers, adult education can bridge academic gaps for aspiring college students in Oklahoma and help Oklahoma residents earn their GED or high school equivalency. Technical Prep for College: Brush up on computer skills and other technical requirements to prepare for the technical demands of earning a college degree online. College and Career Readiness: The Oklahoma Career Guide can help create educational plans for adults, veterans and other Oklahoma students to advance their careers.